Picture this: you and your spouse are relaxing in your swimming pool. The kids play in the backyard, laughing and enjoying their summer vacation away from school. What a perfect way to spend the weekend. All of a sudden, one child throws a ball too hard while the other one runs to catch. He isn’t looking at where his legs are taking him, and he falls straight into the deep end of the pool with a loud splash! He’s only five and hasn’t quite learned to swim yet! You rush over and jump into the water to rescue him. Now picture this same scene, with no adults around to supervise. In this case, the results could have a more tragic end. 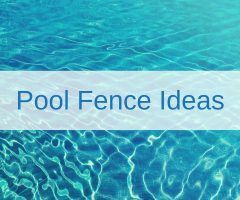 But with a pool fence, there is no need for concern as it offers a little extra protection from your little ones and the glittering waters of your backyard oasis. This is just one of many reasons to install a pool fence. Read on to find out three other important reasons you should install a pool fence. The first and foremost reason to install a pool fence is safety. As depicted in the scenario above, you aren’t always around to supervise who and what might end up in your pool. Some statistics show that around three hundred children will drown in a personal swimming pool annually. And what about your beloved pets? While most of them can swim instinctively, you also do not want them traumatized by the existence of something from which you and your family find so much pleasure. Plus, some local laws may require that you install one for these exact purposes. You may find yourself walking around at night in search of something you dropped in the yard, only to find yourself tripping over the edge of your pool. Next thing you know, you’re soaked. Pool fences could eliminate these scenarios from happening, while also helping you follow the law. Pool fencing is an effect safety barrier that can help prevent accidents. Installing pool fencing can add a personalized touch to your outdoor living space as well as safety. A mesh pool fencing will also allow the glittering waters to sparkle with visibility. 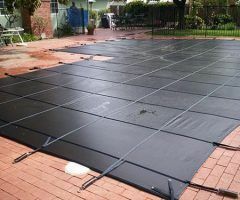 They also look trendy, with chic opaque black mesh and sensible black poles in between. While your neighbor may have a fence that completely blocks out the beauty of the swimming pool with tall fence posts, a mesh fence will allow your swimming pool to continue to add to the aesthetics of your yard. 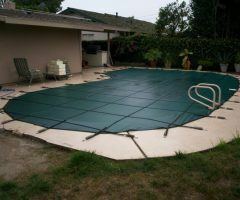 You can still look out at the sun glinting off of the surface of the water as the nonintrusive pool fence surrounds it to ensure safety and visual attraction. Let’s say you want to have the neighbors over for a summer cocktail party. The children are with a babysitter, so there’s no need for the fence to take up a great deal of space. You want your guests to be able to move about freely without having to open a gate. Mesh pool fencing will also allow you this option without taking up a great deal of your time. So while you’re busy getting ready for the party, you don’t want to work up too much of a sweat or spend a great deal of valuable time breaking the fence down. Depending on the size of your pool fencing, it can take less than ten minutes for you to remove it. Plus, it’s easy to stow away and comes with plugs for the post holes in the deck. Now you have a more open space for your guests to move about!